As more sites here jostle to be sold in the red-hot collective sales market, mainstream real estate agencies are also deepening their involvement in this space, marketing such sales alongside property consultancies. For some of these brokerages, it is a part of an expansion of services beyond the home sales and project marketing for which they are usually known, so their joining in the fray adds to a crowded landscape for marketing agents. Huttons Asia has sold S$2.26 billion worth of sites this cycle, including Tampines Court and Park West. Its investment sales team of 15, set up in 2007, made its first collective sales deal with Jasmine Court in 2011, the team's head Terence Lian told The Business Times. PropNex, appointed marketing agent for seven sites, established its investment and collective sales team of about 25 staff, team members and agents in February 2018. The month before, it set up an auction team; it is now planning to have its own valuation department. Its chief executive Ismail Gafoor told BT: "We no longer just want to be a brokerage and are charting a path to go into the consultancy space to add value for our clients." ERA Realty sold S$571.6 million worth of sites this and last year, and has "easily 10 to 20 more" jobs in the pipeline, but its key executive officer Eugene Lim says en bloc sales are "not our main business". Five teams of agents, helmed by division directors with experience in en bloc sales, handle collective sales for ERA. "It's boom town for collective sales - there are more jobs available, so inevitably there are more hands on deck," he said. At OrangeTee Advisory - the professional services arm of the OrangeTee brand established in 2011 - an in-house team of eight handled the sale of Eunosville and Chancery Court, worth S$1.17 billion. Sing Tien Foo, a professor in real estate at the National University of Singapore, said: "There are so many projects now in the market, it's impossible for the traditional property consultants to handle them alone. There are just more opportunities to go around." Real estate brokerages can have an edge in brokering collective sales because of their strong ties with home owners on the ground, he said. Mr Lim of ERA Realty backed up this observation: "A lot of our agents service clients living in estates trying to go en bloc and have good rapport with them. That's how our company got involved in en bloc." Huttons Asia's Mr Lian said the agents on its investment sales team even help sellers they work with to find replacement homes. But Prof Sing said consultancies - firms which offer in-house professional services like research and advisory - have their strengths as well. "Some larger projects may go for those consultancies with longer track records, and their long-term relationships with developers and institutional knowledge with investment sales is valuable," he said. Overall, such firms still dominate in terms of the total collective sales deals done, as they did in 2007's frenzy. JLL, which acquired 2007's top broker Credo Real Estate in 2012, is leading the pack for the cycle that started in 2016. 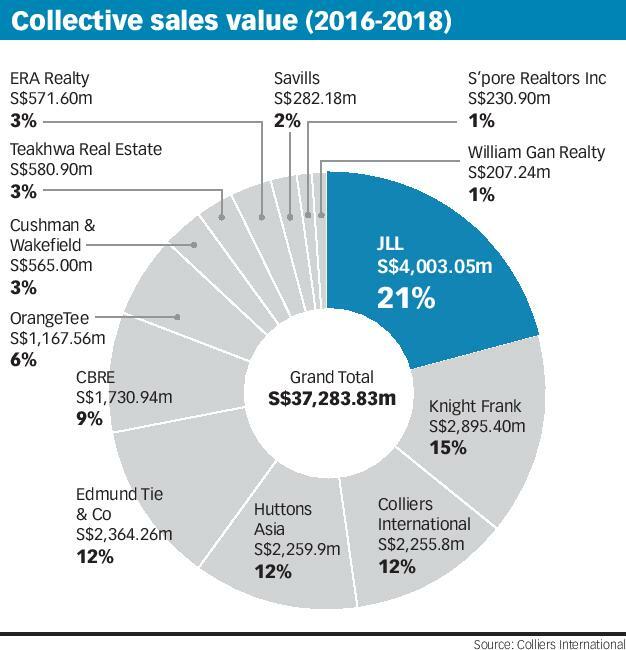 It has sold S$4 billion worth of sites - nearly at the S$4.13 billion tally lodged between 2006 and 2008 by JLL and Credo, said JLL senior consultant Karamjit Singh. That is followed by Knight Frank's roughly S$2.89 billion, and Edmund Tie & Company's S$2.36 billion, excluding single-owner sales. 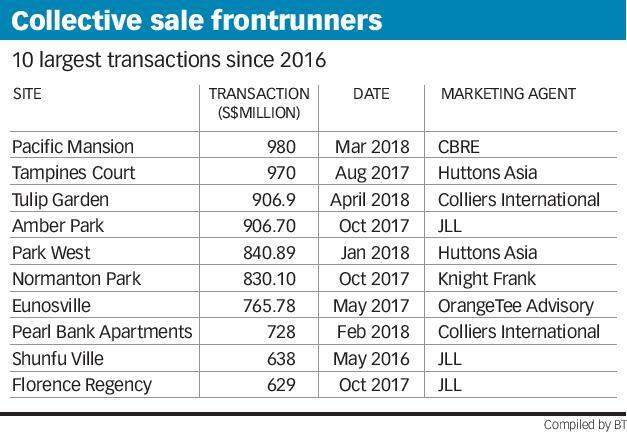 Like Huttons Asia, Colliers International booked S$2.26 billion in transaction value, the two next highest. While the firms BT spoke to did not reveal how much they earn in fee income, industry players say marketing agents typically charge between 0.25 per cent and 1 per cent of the sale price. They may also tier their fee income, by charging a higher rate for the premiums they are able to secure above the reserve price. Industry observers point out that collective sales may look like big money, the reality of it is that marketing a site can take years, at the end of which a successful sale is not even guaranteed. This means a careful balance of risk and reward is called for. Industry observers say expenses can amount to anything between tens of thousands and even hundreds of thousands for more complex deals. PropNex and OrangeTee bear the costs of marketing the site; at ERA Realty, the teams handling the sale (rather than the firms) bear the costs of marketing the sites, although they also get the bulk of the commission for a successful sale. At Huttons Asia, the head and deputy head of investment sales, respectively Mr Lian and Angela Lim, bear these costs. Ms Lim said: "People think that agencies are out to make a quick buck, but it's not true. It's hard work, and a lot of time, money and resources. "We're also trying to fulfill the majority owners' wishes if they really want the sale."